Why volunteering with your family is important. The Rubin family has found many ways to incorporate volunteering into their quality time. Together the Rubins have helped Lucky Dogs get rescued, formed intergenerational friendships through Link Generations and provided nourishment for growing minds with So What Else. Volunteering as a family is an activity everyone can enjoy, while learning the value of doing good things for the causes and people we care about. Making sure we are strategic with OUR volunteering! Cristin was taken aback at first when, Diane, a fellow member of our Rockville Chamber nonprofit mastermind group, asked her what she was doing for her personal volunteering. She laughed and said, "You know full well Diane, that my work with Charity Connect is a volunteer position." Diane persisted and Cristin realized that through Charity Connect she is helping other people volunteer and while she typically "tests out" volunteer jobs for our clients, she wasn't exploring volunteer opportunities that fit HER passions and interests. Cristin is now serving as a business mentor for Cornerstone Montgomery. She is committed to spending an hour a month for 6 months helping to connect her mentee with local businesses in order to facilitate her job as a Supported Employment Specialist. Thanks Diane for helping us stay strategic in our volunteering! Cristin and Diane “make connections” at the Rockville Chamber nonprofit mastermind group. Two friends took a journey to find their "right fit" volunteer opportunity and their paths converged to make a BIG impact. Sam and Noah started with Charity Connect as separate clients and each checked out several volunteer opportunities. While we wanted them to "charity shop" we had a hunch Bikes for the World would be the winner for both. Over the past year, the boys volunteered over 30 hours, immune to rust, grease and hard work, as they prepped donated bicycles to be shipped to other countries. These bikes are vital in countries like Costa Rica for kids and adults to access basic needs such as food, medicine and education. The pinnacle of the boys' service was a bike collection at their super supportive synagogue, Temple Emanuel. Sam and Noah promoted the collection through social media, flyers, fundraisers and speaking engagements. They enlisted their sisters, parents, and grandparents and crushed their goal of 100 bikes, collecting 156 bikes and raising $1,560! When Charity Connect began working with our Student Service Education client, Cece Price, we quickly realized she could be a leader in her community service efforts. We took that spark and added some other powerful ingredients by collaborating with nonprofit, Devenio Inc., and the Devenio Club at Good Counsel was created. In this club, students learn about community-building, program development, advocacy and fundraising by supporting and interacting with Devenio’s programs for individuals with disabilities. Participation in the Devenio Club will enable students to learn from individuals with disabilities and use their voices to create change. Cristin and Lois discuss how to help people understand their out of pocket medical costs. We have loved working with Lois Hall to incorporate her skills and interest into a volunteer opportunity. After retiring from a robust career in the healthcare industry, Lois is now offering her time to help people understand (and often save money on) their out of pocket medical costs. Learn more at www.healthcostmatters.com or contact Lois at lhall@healthcostmatters.com if you have an out of pocket medical cost that is high or confusing. Building friendships one lego at a time! Building a service project with Jonah and his family was as much fun as building with LEGO! Jonah collected LEGO bricks that people no longer needed and worked tirelessly for 3 months (!) with his friends and family to recreate building sets. Jonah brought 50 complete sets to share with the kids from So What Else camp serving kids from low income families. The kids were thrilled to be able to take their kits home to share with their families. Way to go Jonah!! Get one Girl Scout involved and more will follow! Alex and her girl scout troop come together to support youth in foster care. We love seeing our spark burst into flames! We knew Comfort Cases would be the right fit for Alex. Once we started Alex on her service path, she took off! She collected toothbrushes and toothpaste, asked for new stuffed animals for her birthday and enlisted her Girl Scout troop to pack comfort cases for youth in foster care. Way to go Alex! Zoe and friends assembling Jared Boxes for their peers at Children’s Hospital. Zoe used her passion for helping kids who are in the hospital to fuel her fundraising. She hosted a percent of sales event at ivivva girls clothing store. She created a fundraising page and after spreading the word, raised over $800! Zoe bought items that would appeal to her peers that are spending time at Children's Hospital. She and her friends assembled the Jared Boxes and wrote friendly messages on the tops of the boxes. 48 kids at Children's Hospital received those beautiful boxes of smiles! The "right fit" volunteer opportunity for Debra turned out to fit her family too! Debra and her family making an impact at Nourish Now. Debra's story is fuel in the tank for Charity Connect. When we first met, she was looking for a meaningful, long-term volunteer opportunity. Enthusiasm and inspiration enveloped our conversation as we talked about the causes that were important to her. We came up with three cause areas and correlating opportunities and then decided to begin with her desire to fight hunger. We facilitated Debra's first volunteer experience at Nourish Now convenient to her in Rockville. 7 months later, Debra has been helping Nourish Now with their food recovery and assistance regularly for 8 hours a week. Her children, along with some of their friends, also volunteer in the warehouse at Nourish Now and as a family, each week they rescue food as part of Panera's Day End Dough-nation program. The mission of Charity Connect is to help people like Debra find the volunteer opportunity that fits into their life and fulfills them. McLean students team up with students with special needs from Rockville High School to beautify Oasis Farm. 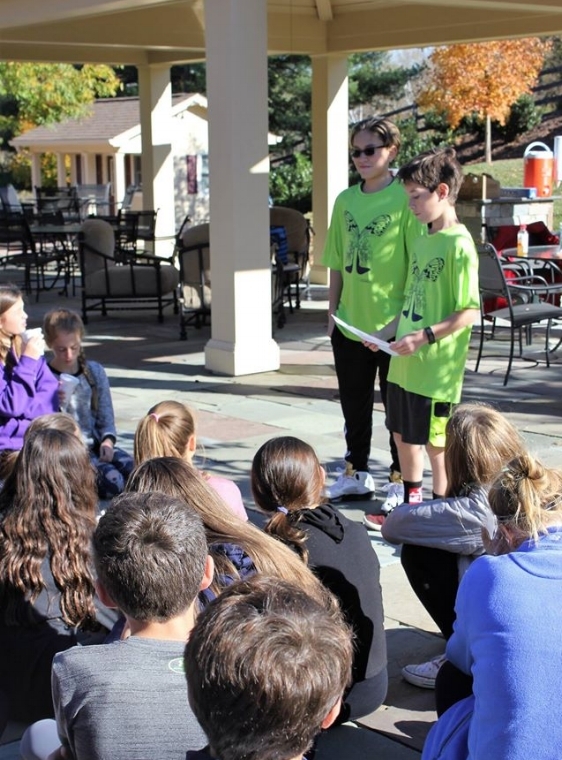 For a Charity Connect service field trip, 33 tenth graders from the McLean School in Potomac worked with 25 students with special needs from Rockville HS to spruce up Oasis Farm. They all enjoyed learning about composting while making compost bins, painting the fence together, clearing the hiking trails and taking turns on the ride mower. Everyone agreed that the best part was making new friends! Ben educating his friends on Cystic Fibrosis. Ella organizing a collection drive involving friends and family to see her mission of supporting youth in foster care come to fruition. Ella Gorodetzky connected with the mission of Comfort Cases, a nonprofit that provides backpacks filled with essentials and comfort items for foster children. She first volunteered with her mom to inventory and organize items for the cases. Wanting to make even more of an impact, Ella organized a collection drive at her school and sent a personal email to friends and family asking for support. Ella didn’t stop there! She recruited more help for Comfort Cases and sparked more connections by hosting 20 volunteers for her school’s Families in Action Day. Way to go, Ella!